Are we all Chinese now that China holds America's trillion dollar debt? 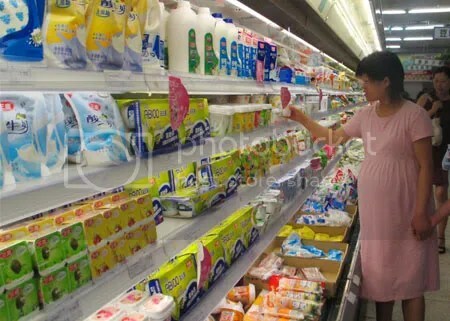 Photo of dairy aisle in Chinese supermarket from China News. Here are some telling excerpts from a recent post on the Haphazard Gourment blog. The Mr. Marler quoted below is a lawyer who specializes in food poisoning litigation. Unlike in the United States where public health officials are pretending it’s “business as usual” (see post below), South African health officials have ordered Nestle to withdraw products from store shelves. 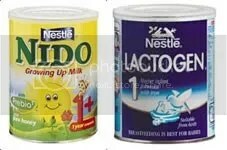 BATCHES of Nestlé baby formula have been pulled off shelves in South Africa after tests showed they contained unacceptably high levels of melamine. FDA finds melamine in American baby formula but recommends parents continue using it — WTF? 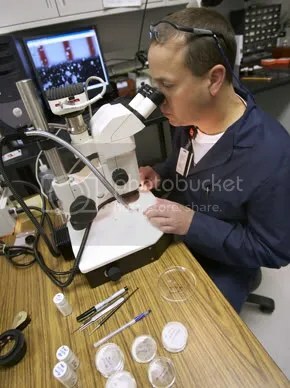 FDA Chemist testing for melamine. FDA photo. “Traces of the industrial chemical melamine have been detected in samples of top-selling U.S. infant formula, but federal regulators insist the products are safe. The Food and Drug Administration said last month it was unable to identify any melamine exposure level as safe for infants, but a top official said it would be a “dangerous overreaction” for parents to stop feeding infant formula to babies who depend on it. 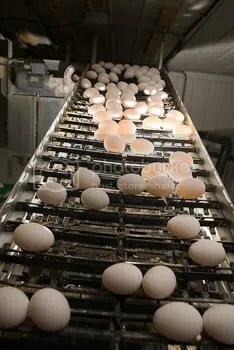 In today’s post we feature a picture parade that tells the story of melamine contamination in milk products, what it is, what it’s for, how it works and some hints on how to recognize and avoid contaminated foods. 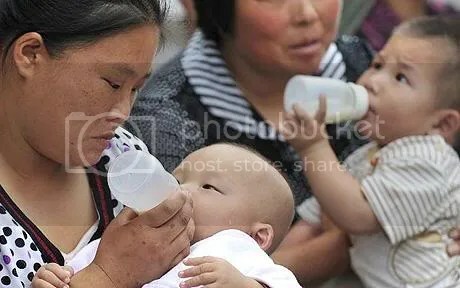 Adulteration of milk has historically not been limited to China. In North America, in the early decades of the last century, substances such as chalk were added to milk from large dairy farms that tried to cut their costs by feeding their cows distillery swill (leftovers from the distillation process) instead of hay and pasture. With it’s fairly recent shift to industrialization, China may well be going through a similar sort of birthing pains as were once felt here in Canada and the United States. But while we used chalk, they’re using melamine. But the purpose was the same — to make the milk seem more nutritious than it really is. Ultimately, the lesson of the melamine scandal is: Know where your food is coming from. Cultivate personal relationships with local growers, because the corporate food chain just can’t be counted on to look out for the health of consumers. Beyond melamine there’s the whole issue of GMOs just lurking under the level of public awareness. How long will it take before GMO contamination becomes the next “melamine scare”? 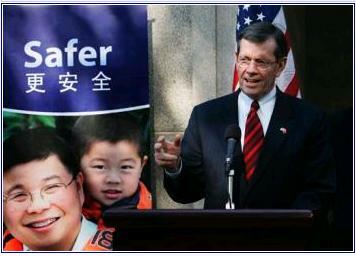 U.S. Health and Human Services Secretary Mike Leavitt speaks at the opening for the new U.S. Food and Drug Administration office in Beijing , China, Wednesday, Nov. 19, 2008. The U.S. Food and Drug Administration opened a new office Wednesday in China's capital, its first outside the United States, as part of a new global strategy to ensure the safety of trillions of dollars of imports. (AP Photo/ Elizabeth Dalziel) -- Caption & photo from Associated Press. In case anyone is in any doubt about intentions to offshore North-America’s food and dairy production, here’s a chilling story from Associated Press about the U.S. Food and Drug Administration setting up a branch in Bejing. And of course they’re cleaning up China’s dairy operations to meet world standards, or so they say.